And I praise Him for His love for me. The health issue that has been plaguing Brett since late August is wearing a new face and it is an ugly one. My heart is breaking for him as he fights against his own body and appears, in this one area, to be losing. He has fought the despair of illness and experienced setback after setback and through it all, he has remained faithful in his desire to believe God more. He has not faltered in his determination to be matured in this trial and he purposefully enters the Throne Room day after day in intercessory prayer. Oh how I love that man. Believe me when I tell you that even though he lives his life seated in a wheelchair, he stands head and shoulders above most I know. He perseveres. He endures. He suffers. But he does NOT waver. And as I pray for him, I am keenly aware that my continuing faith in God’s goodness, Brett’s continuing faith in God’s goodness, has little to do with us and everything to do with Him. As I wrote in the previous post, He refuses to let me be satisfied with myself. With my limited perception. With my oh so small faith. And so like the man in Mark 9:24, I have a decision to make as I watch the one I love suffer. I have come face-to-face with a situation I cannot solve or change; it is beyond me. It is not, however, beyond Him. So I press my eyes closed and I ask God to help me overcome my unbelief. I ask Him to reveal any lingering doubt I may have about His goodness and I firmly determine that this day I will not waver in my belief in the goodness of God. I will stand tall in His armor and declare for all the heavenlies to hear that I will not shrink back nor change my mind concerning Him. And again I feel the rush of excitement and the thrill of belief because He has prompted me to stand firm in Him and I have obeyed. I am at once emboldened and humbled as I realize the depth of my need for Him and the power with which He will undoubtedly meet it. Sister, our God longs to bless His children and if the blessing is not immediate, then there is purpose in the wait. May I just encourage you to hang on and trust Him? May I exhort you to love Him through it all and to rely on His love for you? I guarantee you, based on the authority of His Word, it will not be an exercise in futility. and show loving-kindness to you. His joy, and His matchless, unbroken companionship]! The blessing will come. The need will be met. The tear will be wiped away and the hurt will be healed. Dear One, you are loved by Him and He is aching for the day He is allowed to make your faith sight and to fully reveal His favor to you. Jesus knows that it is hard to be us. He knows how limiting it is to live inside our dying skin. And He knows what it is like to wait for the healing, to trust for the blessing, and to fully rely on the love of the Father. Imagine the agony He felt as He hung on the cross. . . . . . waiting, trusting, relying. He knows Beloved, Oh how He knows. Our Savior is not far removed from our needs or distant from our hurts. We need not be afraid. We need not be discouraged. He has walked in our shoes and laid down footsteps of determined faith. We need only to believe and follow Him. Posted from Blodgett Hospital 1:17 a.m. Even from the hospital you continue to encourage me with his word and faithfulness. My heart aches for you guys and your constant struggle but I am so thankful to have seen first hand what Christ will do with an obedient follower. Thank you both for touching my life and showing me how to seek him with all that I have and all that I am. Caleb and I studied Joshua his senior year. I admit my motive was to do it for Caleb and his spiritual development, but we all know what God thinks of our motives :). This was my favorite verse of the book. I especially like the definition I found for be strong (I think you will like it too Mrs. B). Strong – have the ability to accomplish what is intended, implying an element of resolve is needed as well. It is not a one way deal. I have to accept the challenge that God gives me. I have to use the power I have through the Holy Spirit indwelling me to consider it joy and realize that the testing of my faith develops perseverence and that makes me mature and complete not lacking anything. 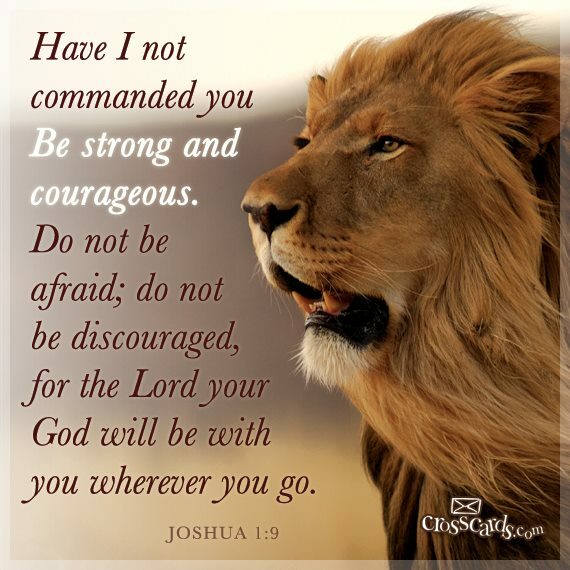 Then I am not afraid or discouraged. He is as close as that filled place in me. Oh I love it when he connects the dots through the whole Word as you say Mrs. B on both sides of the covenant! Thanks for your inspiration in trying times. I am so proud and so blessed to have you, two of the most faithful and focused followers of Christ I know, as my parents. It is my privilege to come stand alongside you today, both in body and spirit, in prayer and excited expectation. well put, Love reading your words are very encouraging!